The Biopac Student Lab curriculum offers a complete life science learning program that can be quickly and easily tailored to meet a broad range of learning objectives and teaching needs. 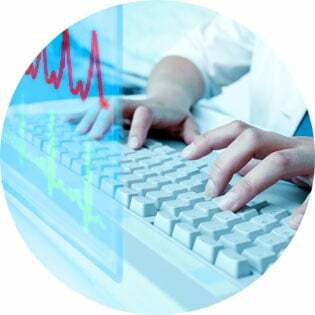 The Biopac Student Lab Curriculum is a key component of the Biopac Student Lab life science education system, which contains world-class hardware, media-rich software, and an extensive and interactive curriculum. Right out of the box, the BSL curriculum allows educators to choose from a number of experiments or design their own, all supported by the the student-friendly BSL system that reduces setup time by up to 90%, so students collect excellent data and focus on scientific principles. For educators, the multi-level learning features of the BSL software let educators control the material and method of each experiment. With over five million laboratory hours and in use in classrooms in the premier learning institutions around the world, the Biopac Student Lab is the preferred teaching solution for life science educators. You can even use BSL for graduate programs and advanced research. 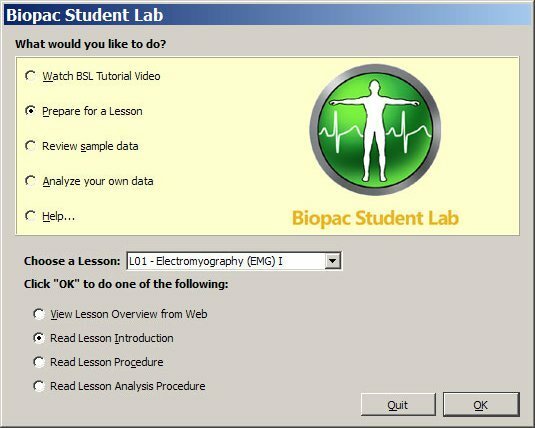 If you are interested in developing your own lessons, or using the Biopac Student Lab system for research, click the BSL PRO Software option. The new Curriculum Management System licensed feature allows educators to easily customize and control all aspects of the lesson content including the on-screen instructions, introductions, recording and analysis procedures, lesson preferences and data reports. 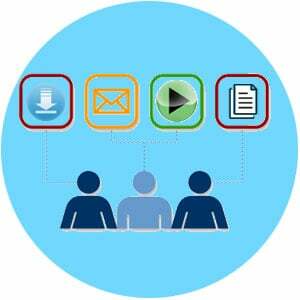 Educators can create their own lessons with BSL PRO, and those lessons can be selectively distributed from the Master computer to all networked lab computers. Learn more today! Request a demonstration to see how the Biopac Student Lab can help you engage students and deliver inspired teaching. Explanation of how to prepare the frog for the following frog experiments: A02, A03, and A04. Stimulate the frog gastrocnemius muscle and record threshold voltage and contractile responses. Option: Stimulate the muscle via the sciatic nerve. Record Compound Action Potentials (CAP) from a dissected frog sciatic nerve. Record cardiac rate and contractile responses of the surgically exposed frog heart. 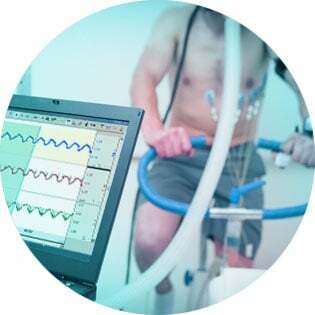 Option: Study the effects of chronotropic/inotropic agents on autonomic control of heart rate. Study the effects of media ionic composition, temperature, and various pharmacological agents on the contraction of the visceral smooth muscle of the rabbit ileum. Record action potentials through a cockroach ventral nerve cord. Measure the metabolic rate of goldfish at two different temperatures (acclimation temp and acute exposure temp) to demonstrate the Q10 principle. 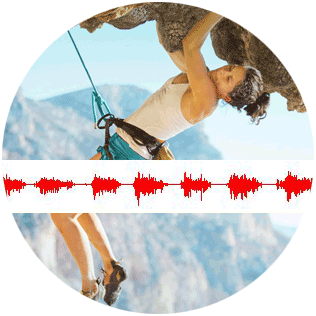 Use extracellular recording techniques to stimulate and record action potentials. Measure conduction velocity and plot Strength vs. Duration. Follows “Lab 4: Crayfish Resting Potential” from the Crawdad Lab Manual. Perform extracellular recording on tobacco hornworm pupae to study central pattern generators (CPGs) and neural mechanisms. Video clip included. Use a force transducer and tissue bath with isolated earthworm gut to measure contractions and the effect of drugs. Video clip included. Examine electrical properties of myocardial cells in the vertebrate heart and study the effects of pharmacological probes on the cardiac action potential. Explore Westheimer’s saccadic eye movement model with actual and model data. Use the MP30 for Nerve Conduction Velocity along the ulnar nerve of a human subject. Video clip included. Use the MP36 or MP35 for Nerve Conduction Velocity along the ulnar nerve of a human subject. Video clip included. Record (noninvasive) blood pressure response to isometric or straining exercise. Record the Wingate Anaerobic Test and complete Wingate Test calculations. In this lesson, the WAnT is performed on a modified, plate loaded, Monark 818E work ergometer. Use a Force transducer to record the finger twitch from a human subject. Video clips included. Use the Finger Twitch transducer to record the finger twitch from a human subject. Design and develop software-based digital filters and cascade 2nd-order biquads. 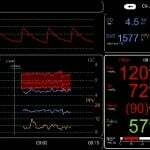 Record and measure relative differences in Cardiac Output and Stroke Volume using a noninvasive bioimpedance technique. 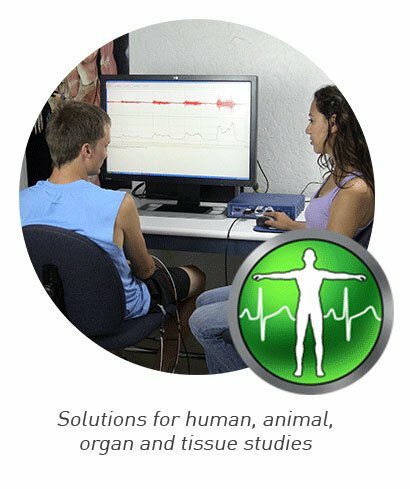 Record ECG data under different experimental conditions and perform a Signal Averaged ECG recording for each segment of data. Record EDR and Heart Rate response to repeated stimulus to demonstrate habituation and its probabilistic trend toward decreased response. Schematics and design notes to build Active Filters, Sine Wave Generator, Logarithmic Amplifier, and Absolute Value Converter with SS39L and MP36, MP35, or MP30. Block diagram to build ECG R-wave detector with SS39L and MP36, MP35, or MP30. Record EMG response on the corrugator supercilii & zygomaticus major muscles. Record knee and ankle reflex response with the SS36L Reflex Hammer transducer. Optional: Use SS20L Goniometer to measure angular movement in response to varying strike force. This BSL PRO lesson describes the hardware and software setup of the BSL System in order to measure Oxygen Consumption (V̇O2) using an open circuit indirect calorimetry technique. Metabolic Rate can then be calculated using the V̇O2 measurement. Record strength of interference between associative tasks: naming & reading. Record the startle response with and without a prepulse inhibition stimulus. Explore statistical measures, geometric measures, and spectral analysis in heart rate variability studies. Build up a square wave composite waveform form sine components to examine the FFT. Record an electrogastrogram (EGG) from a human subject. 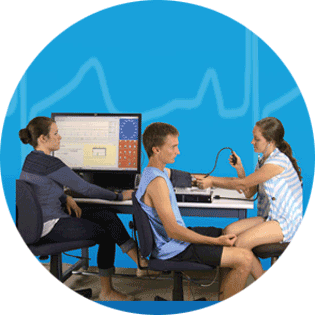 Perform Range of Motion (ROM) and Sit and Reach tests with a goniometer and compare to normative values. Measure changes in EMG with maximal contraction, as compared to baseline, incorporating different combinations of visual and auditory feedback. Reaction Time & Learning with fixed-interval and random presentation tTrials of auditory (click) stimulation.